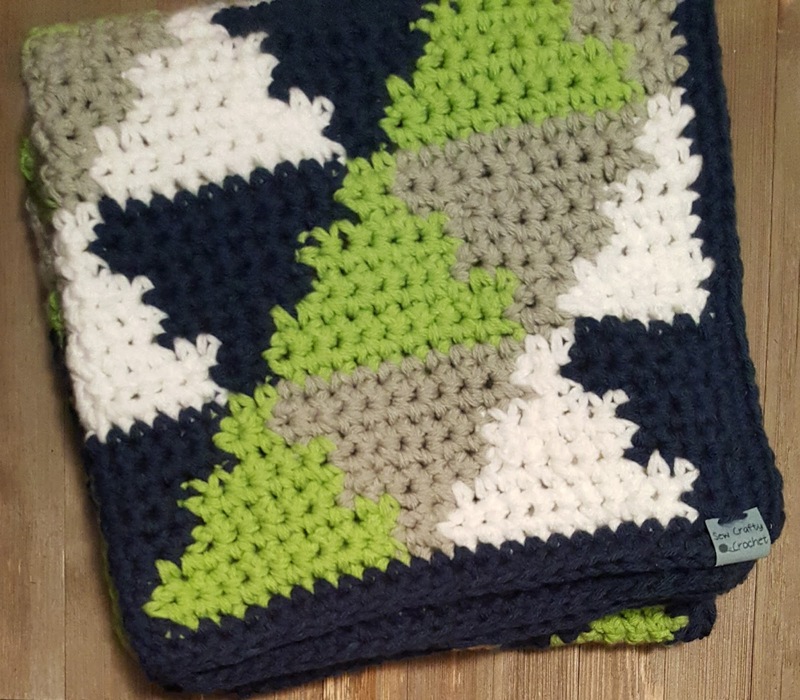 For Mother's Day, I made my mother a crochet throw with triangles in the colors gray, yellow, white, and blue. 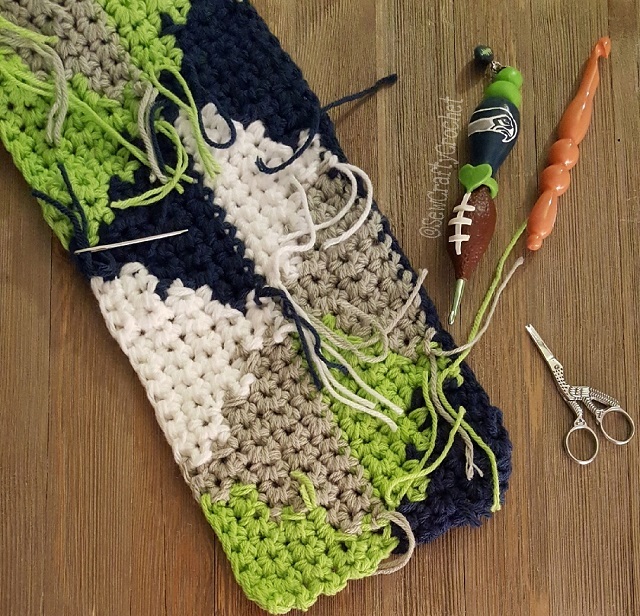 Since I enjoyed making that throw and it used up quite a bit of yarn, I decided to make another in Seahawks colors. 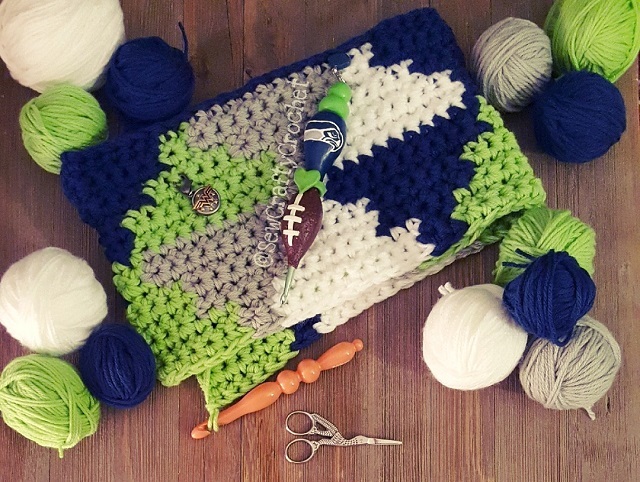 I am on a stash busting mission, and I originally bought a bunch of yarn in Seahawks colors with plans to make a bunch of Seahawks inspired hats and a temperature super scarf. I started the scar, but decided not to continue with that project, but I still had all that yarn. 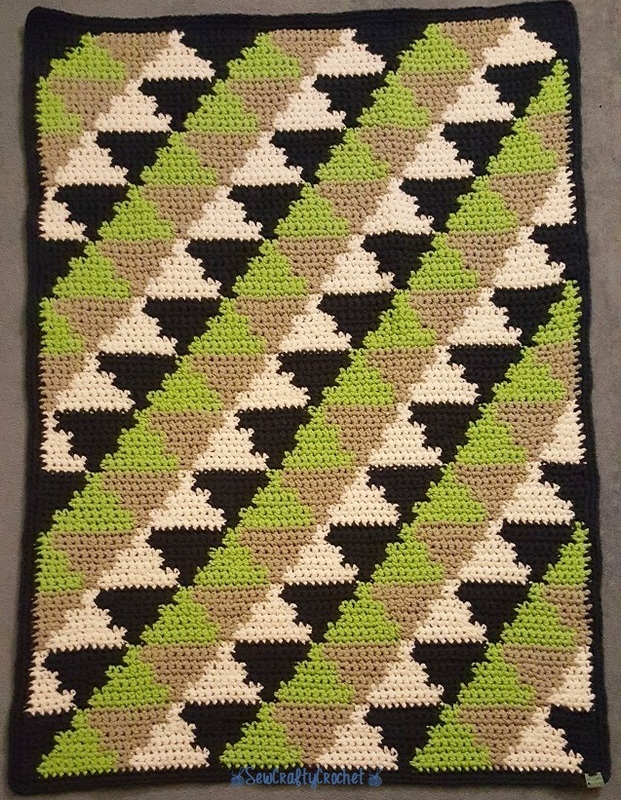 So, I used it for a triangles blanket. For this blanket I used Big Twist Yarn in Dark Denim, Lime, and Soft Gray. The White yarn is from the brand I Love This Yarn. 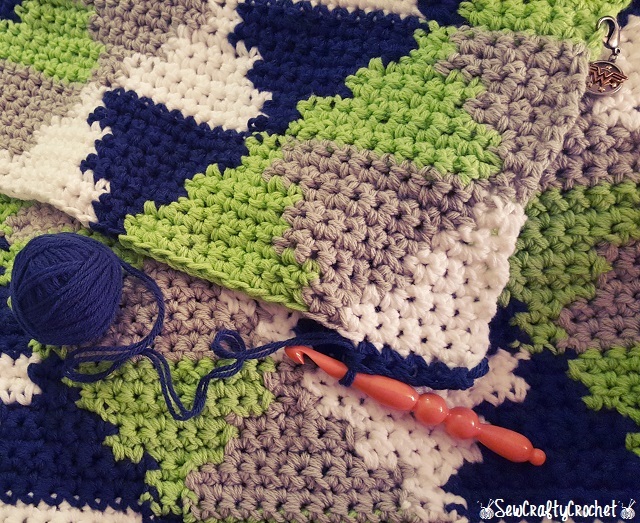 While crocheting this blanket, I had about 12 balls of yarn in my lap. 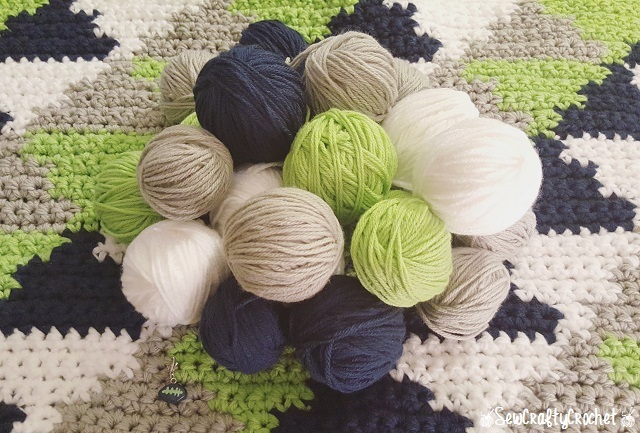 Each triangle in a row needs it own ball of yarn, and you crochet with two strands. For this project, I used my new size P crochet hook . This pattern is called Sunset Shades Throw, and can be found in the book Q-Hook Afghans for the Family . With this project, there are tons of ends to weave. I like to weave them as I go, so I'm not overwhelmed with ends once I've completed crocheting. 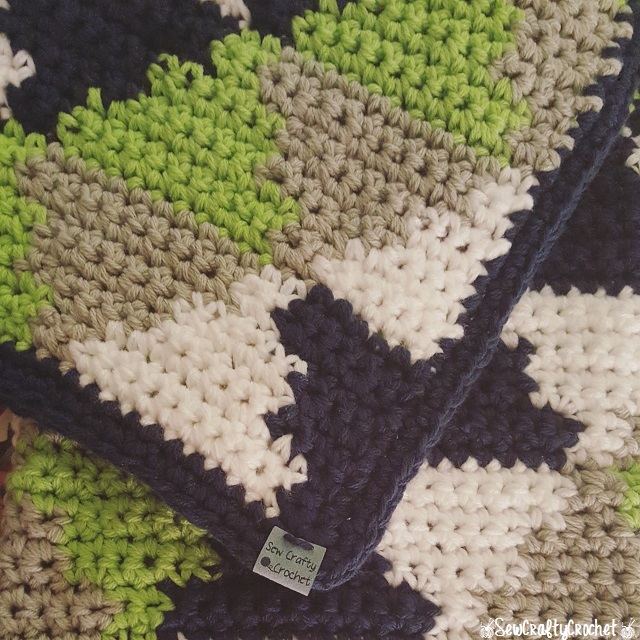 This blanket measures approximately 48 x 36 inches, so it would be a great baby blanket! 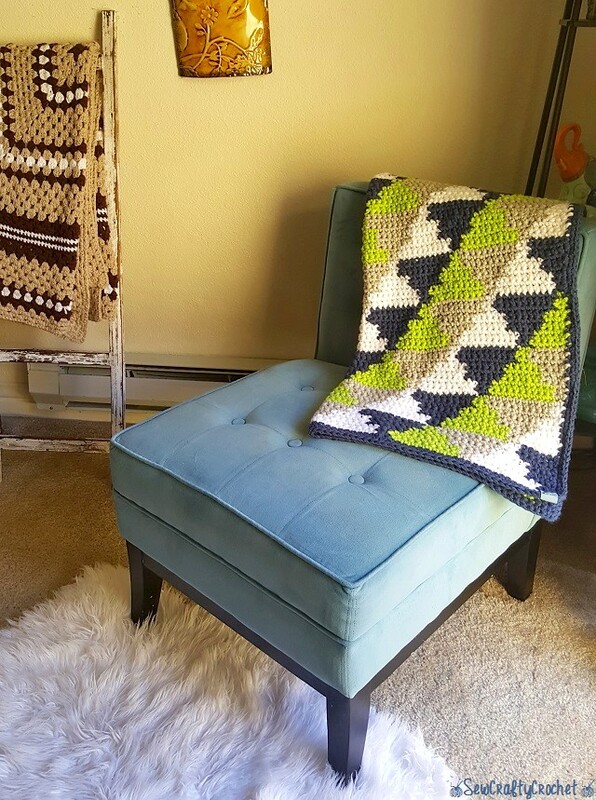 Or it would be great as a throw blanket for your favorite chair! This blanket is available in my Etsy Shop! This is a stunning throw T'onna! I have not crocheted in years, but I've been getting the bug back lately - and this has got me more excited about it than ever! I'll have to revisit for more inspiration posts. Thanks for sharing (and inspiring!). Thanks so much, Jelica!!! I'm glad you found inspiration here on my blog!